« The North Shore x61 Condos along Marine Drive North Vancouver District Featuring 1-3 Bedroom North Van Apartments for Sale! A new Polygon Coquitlam condo project is now launching at the masterplanned Windsor Gate community! This exciting new development is called the Bradley House at Windsor Gate and home buyers will find a limited and very exclusive collection of low-rise 1, 2 and 3 bedroom apartments for sale. The architecture is inspired by Frank Lloyd Wright and has a distinct modern West Coast feel and look to it. Centrally located close to Coquitlam Town Centre, the Windsor Gate Coquitlam Bradley House condos will be move-in ready at the end of 2014, so there is now presales or preconstruction wait times for prospective home buyers! The landmark development at Windsor Gate Coquitlam introduces the Bradley House condos that come with contemporary interior design that features open layout floor plans that are both spacious and efficient as well as gourmet kitchens with the latest in high-end appliances, counters and cabinetry in addition to outdoor living spaces. Close to all the amenities of downtown Coquitlam Town Centre as well as recreational facilities and outdoor activities such as Lafarge Lake and Coquitlam River, home owners and residents at the Bradley House Coquitlam condos will also be within a stone throw away from the future Evergreen SkyTrain Line station, connecting you to the rest of the Tri-Cities as well as Vancouver. Lots of eateries, cafes, restaurants, boutiques and big box retailers are nearby as well. Local services, Coquitlam Centre, Glen Park and Westwood Park are also within a close walk or drive away in addition to Lougheed Highway thoroughfare. Great schools are also nearby. 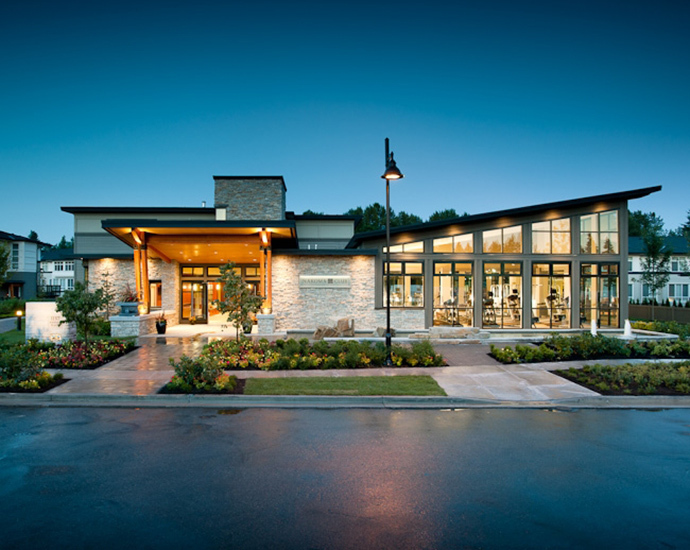 For those homebuyers not familiar with Windsor Gate’s Nakoma Club, the residents at the Bradley House Coquitlam condos will have access to this exclusive amenity space and clubhouse that features over 18,000 square feet of indoor and outdoor amenities. This includes a beautiful outdoor swimming pool landscaped terrace, full fitness centre and gym, screening room, great room with fireplace, guest suites for out of town guests and a resident concierge. For more information about the homes at Bradley House Coquitlam Windsor Gate by Polygon, please register your interest online at www.polyhomes.com today for all the details as well as the floor plans and features. The project site is at 3107 Windsor Gate Coquitlam BC. PLEASE NOTE that these are some interior finishes that we expect at the new Bradley House condos in Coquitlam and are NOT confirmed by Polygon. Please speak with a sales staff directly in order to receive the final draft features list for these beautiful new homes at Windsor Gate. Some of the expected finishes when looking at previous Polygon condo projects at Windsor Gate include such features as beautiful colour palettes that are professionally designed and selected, wood laminate floors in main living areas as well as gourmet kitchens with polished engineered stone counters, glass tiled full height backsplashes and even premium stainless steel appliances included with your purchase price. Other draft features based on previous Windsor Gate condos at the Coquitlam Bradley House condos include such things as large pantries for extra storage and beautiful ensuites and bathrooms that have refined details including vanity mirrors, recessed lighting and water conserving fixtures and toilets. The Bradley House floor plans will offer one, two and even three bedroom family sized condo layouts for prospective homebuyers, giving you lots of different variety in choosing your next home. The entry doors are usually solid wood with richly stained and polished chrome hardware. The kitchens will likely have soft close cabinet hardware, sleek under cabinetry lighting and built in recycling bin. The appliance package at the Bradley House Coquitlam condos will also likely have a dishwasher, fridge with bottom mount freezer, microwave with hood fan system and a gas cooktop and self cleaning range. The bedrooms will also have durable plush carpets and there are low-E windows and sliding or swinging patio doors onto expansive outdoor living spaces. The Bradley House floor plans will also have laundry closets with stacked washer and dryer that are energy efficient and vented out. There will be TV outlets and telephone jacks located in very convenient spaces and all homes come with the Polygon New Generation weather protection system. The building will be secured and residents will have access to the building and amenities via key fob. There is underground parking too. 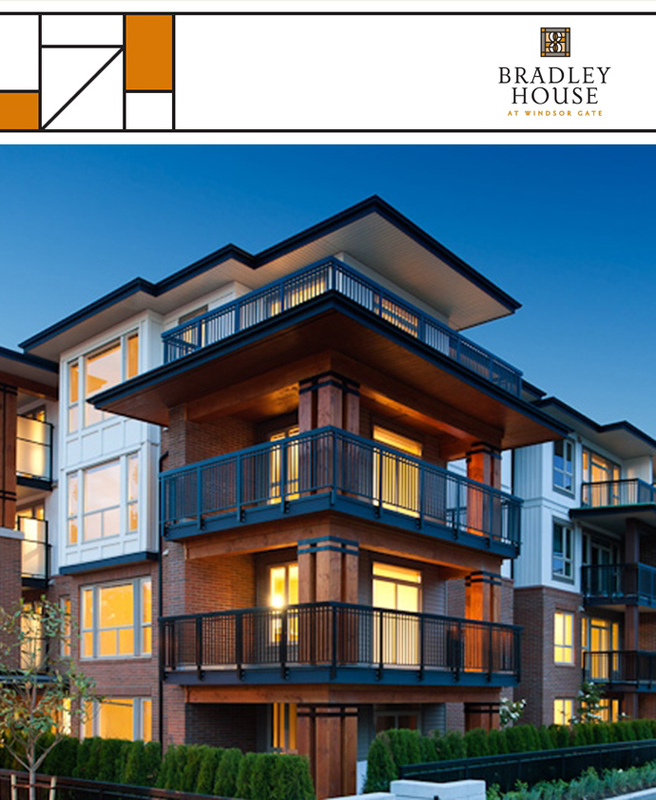 VIP Previews at the Coquitlam Bradley House Condos Begin Saturday, November 22nd! From their email marketing: Bradley House Coquitlam condos, Polygon’s highly-anticipated new collection of one, two and three bedroom apartment residences at Windsor Gate, has opened for previews on Saturday, November 22nd! The developer and sales team are just finalizing all of the details in our sales centre and look forward to unveiling this new collection of move-in ready homes and our three stunning display suites at the Bradley House Windsor Gate condos. Located at the heart of the prestigious Windsor Gate masterplanned community, Bradley House Coquitlam condosboasts an unparalleled location, just minutes from the future Evergreen Line, Coquitlam Centre, and endless shops and services. And with the exclusive residents-only Nakoma Club at Windsor Gate right next door, featuring 18,000 square feet of resort-style amenities, you’ll have it all – at home and beyond.